Episode 1: Ignorance is truly bliss. A normal American teenage life or a demon-filled, magical nightmare for the rest of your life? They’re both sort of hellish but I’ll skip on the latter any day. Let ‘em know once and one time only - that you are not one to be crossed. Sometimes it seems like everyone and their momma wants you to do the thing that you do not want to do. And you know what? Screw that! Do you boo. Episode 4: You’ve gotta crawl before you can walk. Sabrina is eager to breeze through the School of the Unseen Arts so she can bind and banish the dark lord but she finds out pretty quickly that it won’t be a walk in the park. Episode 5: Your demons will set you free. 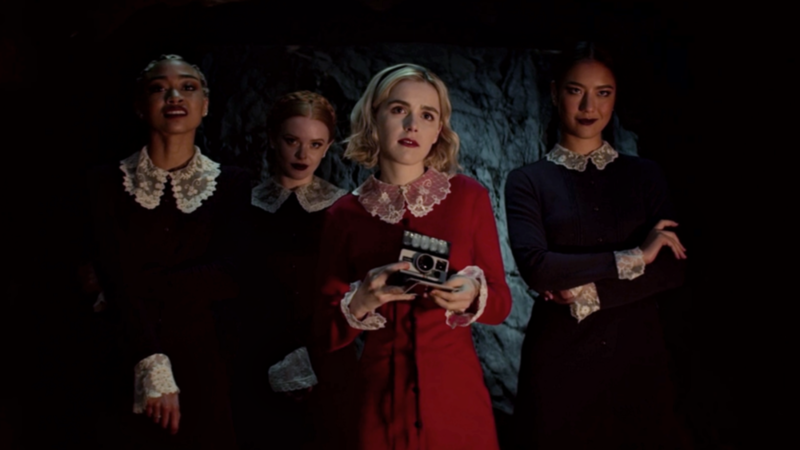 Everyone’s under a night demons spell that tortures the hell out of them, literally - but Sabrina faces her fears and gets rid of the crazy bat. Episode 6: When your friends need you, come through with an assist. Uncle Jesse’s possessed and no one cares about it but Sabrina. Lucky Jesse, because there’s pretty much nothing Sabrina wouldn’t do for her friends - even an illegal exorcism. The students at Greendale High are tasked to learn where they come from and discover dark family secrets along the way. Harvey’s brother, Tommy, dies at the hand of the Orphan sisters and Sabrina gets the bright idea of a resurrection spell. Not smart ‘Brina. Tommy’s back and it’s tearing Sabrina and her family apart. She’s driven further into Ms. Wardwell’s web from which there may be no coming back. Sabrina finally signs herself over to the dark lord to save the day - but she just might’ve lost herself completely. Sabrina once again tries to take matters into her own hands by summoning her dead mother during the Winter Solstice where the veil between our world and the afterlife is at its thinnest. Surprise, surprise, it doesn’t go as planned, a little chaos ensures, but in the end the family rallies together (like they always do) and make things right.